Swing for the fences: Realmuto + Harper/Machado + Keuchel (may have to include Velasquez or Pivetta in Realmuto deal). Now THAT would generate some season ticket interest, Mr Middleton. The Marlins have so many holes and are in such a strong division that I don’t think they need anything in particular back. They just need to get good future value back for Realmuto and put another warm body on the field this year. They may take Knapp back to fill the hole, or just pick up a cheap vet, and get good prospects back from the Phillies. If they do want a young mlb ready guy back it could just as easily by Kingery, Williams, Eflin, Pivetta, etc. who gets included in any deal. If we got Realmuto I think it is 99% certain we deal Alfaro. The real question is the next part of the deal. Could be Sixto and then a major leaguer like Williams or Velasquez. Add a second tier prospect and it starts being expensive. I would also take a bet that 5 more years of Alfaro will be more valuable than 2 more years of Realmuto. We need some young players to be part of the base. Getting Machado or Harper is just much more important than getting Realmuto because we can do so while keeping our younger prospects or players. Plus money of course. I would also take a bet that 5 more years of Alfaro will be more valuable than 2 more years of Realmuto. Alfaro turns 26 next year. His biggest knock in my book is high strike outs, but he has only had one full season in the bigs. The Marlins are, and rightfully so, asking for a kings ransom for JLT and two seasons. This Kings ransom could come back to bite the Phillies in the NL east. Why didn't they just re-sign W. Ramos? I am not sure Alfaro will ever be great, but I am pretty sure his defense will be above average. He is already good at framing and throwing. The blocking should improve over time with some work. As for offense, he may always chase too much. He did make some tiny strides in his discipline in the second half and his OPS went from 700 to 788. An Alfaro with good defense and a 750 OPS seems like a 2-3 WAR catcher to me. There is a good chance that he does this. Which is why I don't want Ramos who might not be better than Alfaro. Realmuto is clearly better. I just see less need to improve at catcher at a high cost when there are other ways to improve the team while keeping our young prospects. We are trying to win now AND in the future. Keeping Alfaro does not really hurt the goal of competing now, so why not preserve some future too. Trading for Realmuto as a reaction to not getting Harper or Machado would be a step backwards IMO. Trading the future for a move that is not likely enough to win today. would also take a bet that 5 more years of Alfaro will be more valuable than 2 more years of Realmuto. But what about 5 years of Alfaro vs. 5 years of Realmuto? I don't think they trade for him if they aren't prepared to pay his next contract and given what Ramos and Grandal took this year who knows if it will even be that onerous. He may take an extension immediately (or a least during arbitration next year). But what about 5 years of Alfaro vs. 5 years of Realmuto? 5 years of Alfaro might cost $20 million total. Might be $100 million for Realmuto plus the players or prospects to get him. And I totally discount the value of re-signing a player as part of the benefit of acquiring them. Realmuto's age 28 and 29 years pre-free agency are really good. Age 30-32 might be overpriced 2 WAR years for an aging catcher. That might be fair value, but it is not added value. Like it or not, any catcher over 30 is potentially a risky play. True. But he's a mighty appealing player. If you think (as many do) that they still need to add a second bat (at either 3B or OF) in addition to Machado or Harper, Realmuto does it. Clearly they are starting to think more short-term. There's no longer a three-year plan to make the playoffs, win a series or two, win it all. They want the NL East and a possible WS appearance this year and/or next. Of course first report is Marlins want Sixto. I'm not suggesting he's injured now, but if Phils- knowing what they know about Sixto and his medicals- believe that there is a good likelihood that Sanchez is on a collision course to TJ in the next 2 years, then i'd be ok with that deal (not that they'd ever confess to that). The problem is that Sanchez and Alfaro would be too much, but the deal could be expanded on the Marlins side. I don't know that it would be too much, but it would definitely be the end of it (though agreed Marlins could send something back). Making them pick one or the other plus two other pieces not a bad approach either. My guess is Sixto does end up being traded (assuming, indeed, that he doesn't get hurt further). If they don't do it now, he'll be what everyone wants for a stud deadline pitcher. OTOH teams rarely give up their top prospect in deadline deals. Alfaro might be expendable b/c the Phillies in 3 years could have a lot of solid catching prospects lined up in AA and AAA ball. But Alfaro, Sanchez and ... a bit rich for my taste. I don't know that "Alfaro, Sanchez and..." would be "franchise-wrecking," but it's too high. The good news is it's a buyer's market or the Phillies wouldn't be back in (because a deal would already be done). That the Marlins asked about Sanchez, and that we are assuming Alfaro would be included, doesn't mean either has to be true, let alone both. What if "Williams and De Los Santos and..." got it done? Heck, they could have Knapp too. If they seriously want to close the deal on Friday and nobody's met their price yet, you never know. Any other $ the Phillies could also take on at this point? We don't have a single low minors catcher that looks like a good shot at being a major league regular at the moment. We have a bunch of kids with a 10% shot. That is no reason to feel good about trading a 25-year-old starting catcher. Our best prospect (according to Matt Winkelman) is Marchan (11) and he'll be at Lakewood this year. Duran (17) should be at Clearwater, but there is no indication he is faster than a level per year guy. Grullon looks like a backup at best. Then everyone else was in rookie league last year (O'Hoppe, Gutierrez). We will probably get a good catcher out of that group. There is strength in numbers. It just might be 5-7 years before that happens though. Yeah I don't understand the argument there anyway, if the Phillies could have solid catchers in AA and AAA in three years they'd still need a catcher from 2021-2023. Not that there aren't other ways to find one. Which would you rather, Sixto and a package w/o Alfaro or Alfaro and a package w/o Sixto? If I had to choose it would be Alfaro plus lesser prospects like Medina or Howard. Still would prefer to sign a big bat and then use the prospects to upgrade our pitching if it came to that (or a second bat at the trade deadline if Machado/Harper alone were not enough). I'd rather keep Medina and Howard. I just don't trust Sixto's health. With Alfaro, I see no need to trade for Realmuto. Sign Machado. That's the proper play. 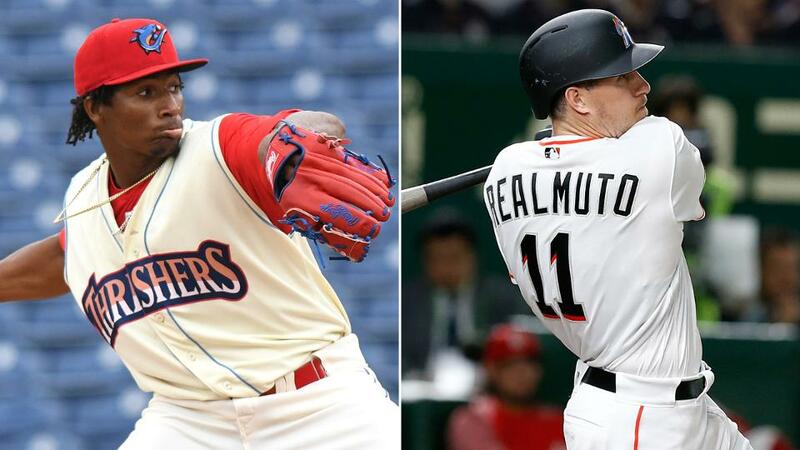 I would rather trade neither package, however if Realmuto is to become a Phillie I would rather give up the package centered around Alfaro. I can't imagine he would be kept as a back up catcher so he would most likely be traded in some type of package anyways.